Million Dollar Throw by Mike Lupica is the inspiring story of true friendship. Nate Brodie is a massive Tom Brady fan. Because of that and his arm he is often called Brady. He plays quarterback for his school football team in Massachusetts. Nate starts feeling a lot of pressure when his dad loses his job twice, his mother has to start working two jobs, and one of his closest friends named Abby McCall starts going blind. This pressure affects Nate on and off the field, but Nate soon realizes that his pressure is very little compared to others. Abby then learns that she may have to go to a special school for the blind, and this harms Abby and Nate’s friendship even more. Nate hears about a throwing contest held by the Patriots, Nate’s favorite team. Nate decides to go to the event and see if he could win. The night of the contest comes quickly, and before Nate knows it it’s time to leave for it. At the contest, Nate meets his role model Tom Brady and wins the throwing contest. The prize is one million dollars which Nate offers to Abby for a surgery that could fix her eyesight. 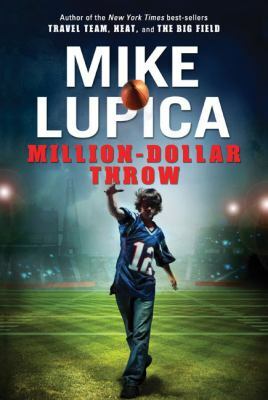 Million Dollar Throw by Mike Lupica is available for checkout from the Mission Viejo Library. This entry was posted in Book Reviews and tagged baseball, blindness, families, friendship, people with disabilities, sports by emilio04vargas. Bookmark the permalink.